Faith. Everybody lives by it—even atheists! That's right. Everyone you know trusts something they believe in but can't prove or know absolutely. They take it on faith. And if you want to talk to your friends about your faith, it helps to understand what they believe and how they got there. Because badgering people to change their minds just doesn't work. 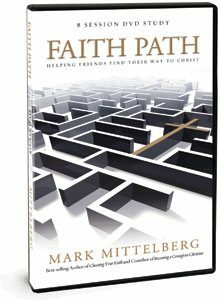 The eight-lesson Faith Path DVD, based on Mark Mittelberg's book Choosing Your Faith, builds on the author's sensible, even-handed approach to evangelism. Filmed live with an audience, lessons include teaching from Mittelberg, short interviews with six fascinating individuals talking about the six faith paths they were on before they came to Christ. Use this DVD in conjunction with the Faith Path workbook to start a discussion about faith today!